Your online world gets better when everything works simply and effortlessly together. Pity that the 'out of the box' experience (1) didn't work, (2) wasn't simple (3) wasn't effortless and (4) lacked 'togetherness'. I clicked all the bits that looked clickable, watched as things changed. One box said: "You can see your Windows Live Mail or Hotmail inbox here if you sign in." "You can see your Windows Live Mail or Hotmail inbox here if you sign in *AND* you've joined the beta program, for which we send you to a page from which you have to hunt around before going to another page... and even then you'd better have hotmail because we don't accept anyone else." 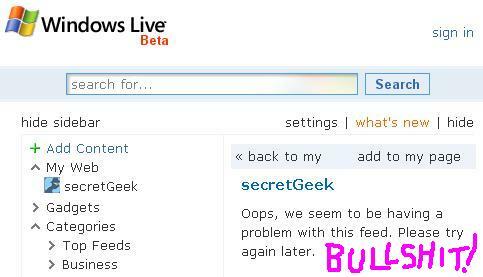 But of course the real test of an aggregator is: Does it successfully aggregate secretGeek.net/rss.asp??... the answer a resounding NO! The reason i use swear words (sorry about that., by the way... I went all blythopathic for a moment) is that they imply that my feed is bad. Not true (this time). This time, I'm pretty sure the mistake is on live.com's side. And there's no hint given about what's wrong. Damn them. I could plug in to my gmail account. And have it refresh on demand. Omar Al Zabir Portal AMAZING ajax Portal written in the year 2000 !!!! Kudos to the people who worked on this project though. They've definitely got some very talented people, and I hope that criticisms of live.com don't cause too much stress to the developers who've made it happen. I just find it interesting that even a multi-mega-billion dollar company can't get a launch to work seamlessly, even when the whole pitch is about working seamlessly.